In our modern times with the focus on material goods and hoopla around Christmas, I always find myself wishing I could create that Nah-Who-Doray moment for my kids. You know, the moment when the Whos down in Whoville experience this overwhelming sense of peace and kindness on the fateful Christmas the Grinch visits their town. I watched How the Grinch Stole Christmas annually and religiously during its major network 30 minute timeslot without fail during adolescence. I still think so highly of those Whos. I surely would not have reacted so peacefully. I’m still baffled by it. Really, they tried nothing to get their stuff back? 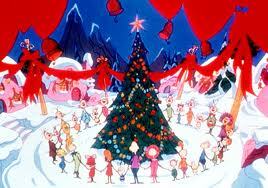 Due to Dr. Seuss’ extreme Christmas scenario, I often entertain thoughts of presentless Christmases. Other families do it (by choice or not) and survive. Quite possibly it brings them closer. However, I’m knee-deep into Christmafying again. Our bay window boasts a canaan frasier complete with lights and decor, a mantle with stockings hung with care (or come to find out later, hung in a particular order) and a plethora of ornaments dating back to my and my husband’s childhoods. I might not partake in Black Friday, but I had been to the Mall of America for past three Saturdays – shopping up a storm. Too late to turn back now. The kids’ eyes lighting up with delight at the thought of presents. Lists had been made. Seeds of electronic hope had been planted. After I dissuaded my 6-yr-old son’s iPad request, he shrugged it off, I’ll just ask Santa for it then. The Whos must have had these materialistic traditions too. Whoville homes were adorned with decor, the fridges stuffed with Who Hash – even the kids slept with candycanes in their clutches. To break from Christmas overload, I reassured myself we’d focus on traditions and counteract shopping guilt. 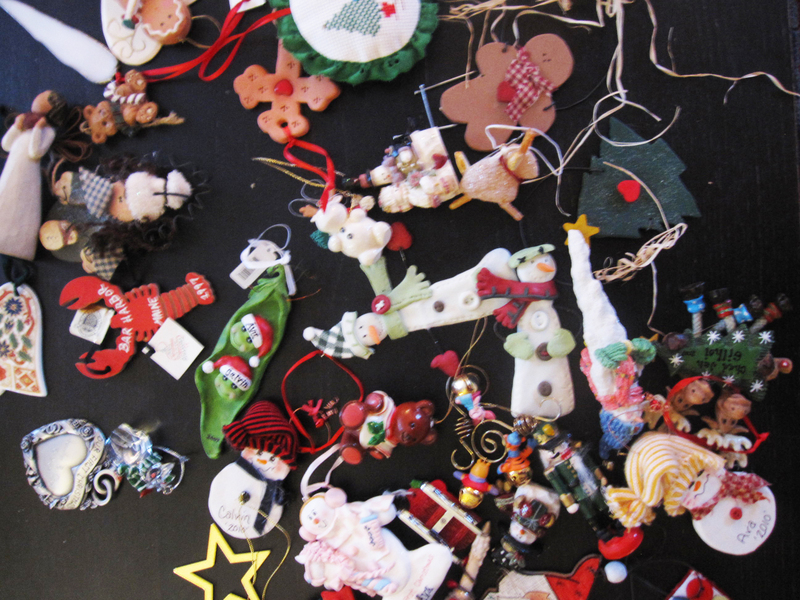 We’d have an at-home weekend that included traditions like purchasing a real tree, recalling the past with ornaments, decorating with stockings and loading up the advent calendar. 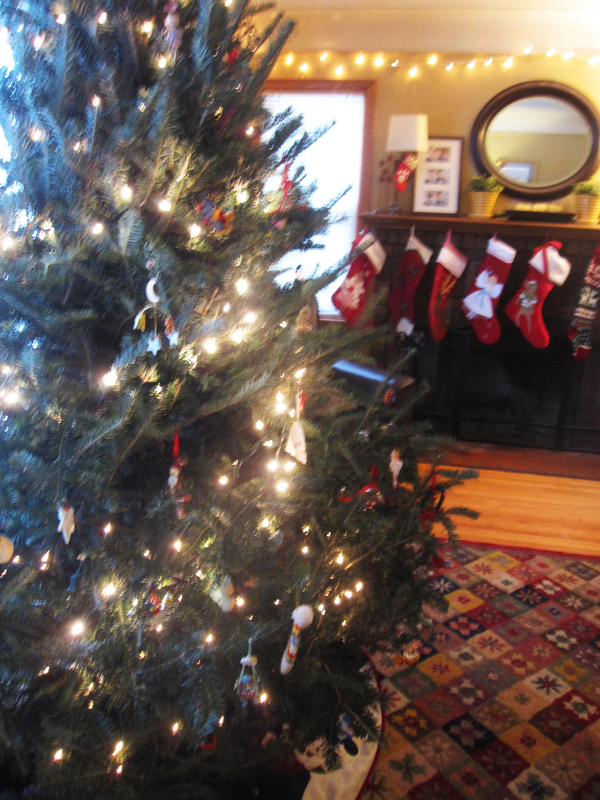 For Saturday, we tackled the tree-buying. The warmest weather I can ever recall and we found our tree match within three minutes at the Richfield Farmer’s Market. Our tallest and fullest tree by far. It drank 18 cups of water the first day. Last year’s 200 lights wouldn’t cut it so we added another 150. If the Grinch visits, he’ll not be stuffing this tree up the chimbley to fix a broken light on one side. On Sunday, the ornaments came out of their bubble wrap and waited their turn on the table to be recalled upon before taking their prominent (or not so prominent) place on the tree. This year’s two new personalized ornaments were the first to go on – TaeKwonDo and musical notes that both kids will share – memorializing forever their first year of hi-yah class and piano lessons. We play ornament I SPY nightly now. This year, my daughter insisted on adding more nails to the mantle and seven stockings went up in a seemingly random order. Later Ava confided to my husband that they went in order from nicest to meanest. Mine was leaning mean. And when my son learned of his rank, six of the seven came down. Only his remains. That’s the Grinchy spirit! Day 4 on the advent calendar door opened to a gold coin and some chocolate. I’m thinking about adding a little task to each day that gets the kids a little closer to good. It may help open their one-track minds about other joys of the season. At the moment, I’m hard-pressed to envision any amount of reasoning that could keep them angelic if a Grinch Christmas hijack were to occur. All told, we’re having a fairly self-centered Christmas season so far. How might we turn this around I’m still asking. Maybe additional visits to church? Volunteering? We are making steps by doing some community giving, lowering the extended family present count by force (one gift to the name drawing exchange this year) and resisting the urge to get the kids too many presents. Yes, I’m a mean one. Just call me Mrs. Grinch… Look on the bright side kids, we’ll schedule a family outing instead. What does everyone else do to help their children find the true spirit of thankfulness and giving among the holiday madness?